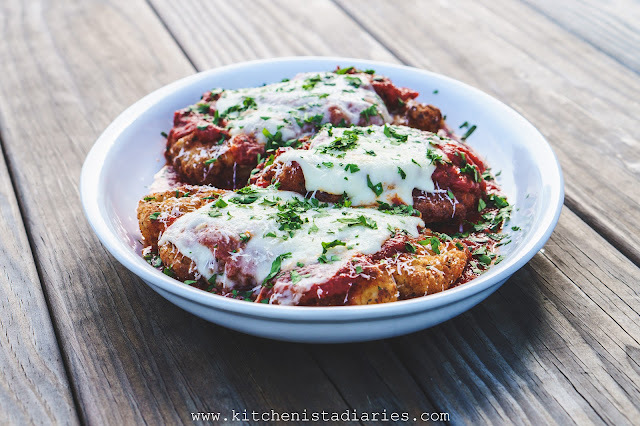 I didn't remember until I worked on this post, but chicken parmesan was one of the first dishes I enjoyed cooking on my own as an adult. Breading chicken seemed like a really big deal back then. Huge. Ten years later, it's safe to say I've graduated from this stage in the cooking game. I almost felt silly for posting this simple recipe, but it was a fun trip down memory lane that I wanted to share. 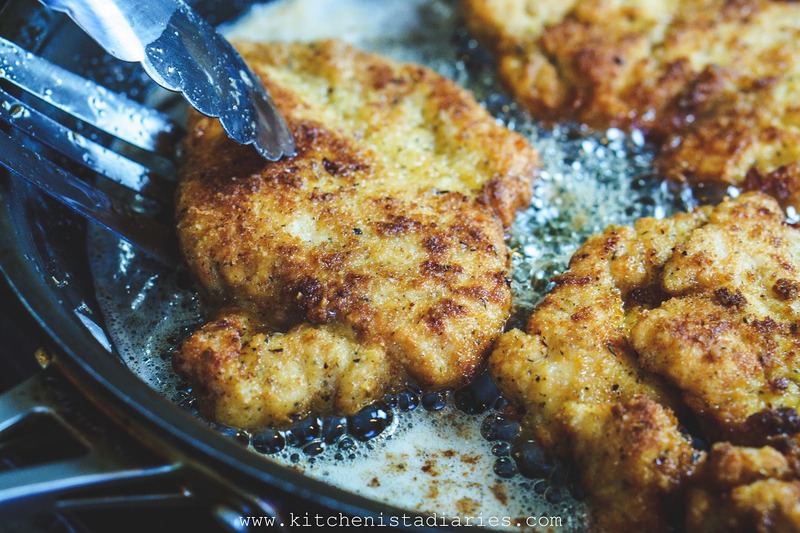 I also snuck in a few tips that will sharpen your breading and pan frying techniques, as I certainly have improved my methods over the years. I'm sure back then I was using the green can of parmesan cheese, regular bread crumbs, and chicken breasts that were too big to cook evenly... all of that is thrown out of the window here. 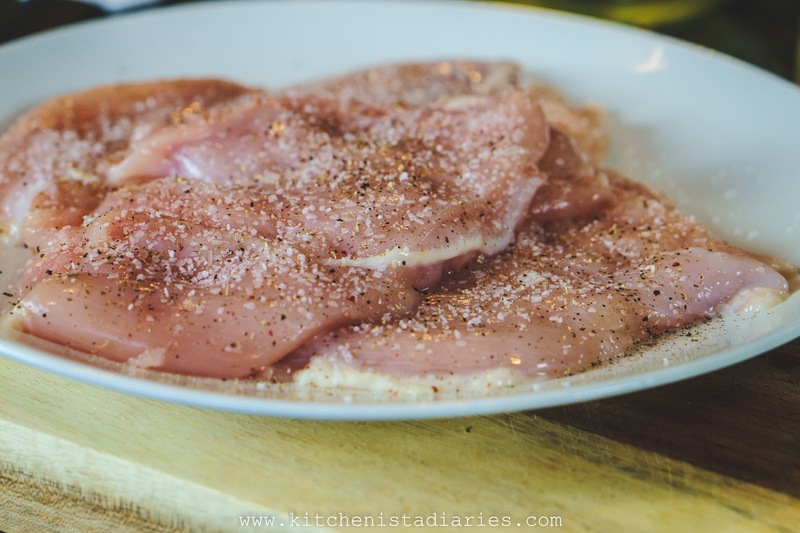 For those of you who enjoyed the grilled chicken breast tutorial, this is another one that's worth holding onto! I'm excited to introduce another product from Hatchery in this post! I picked this one out myself from Hatchery's marketplace earlier in the fall. 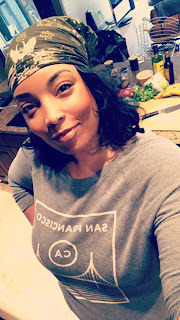 Y'all know I love my specialty ingredients (and I'm about to dive into those in the next few posts) but I also want to highlight the everyday pantry staples that Hatchery sells. 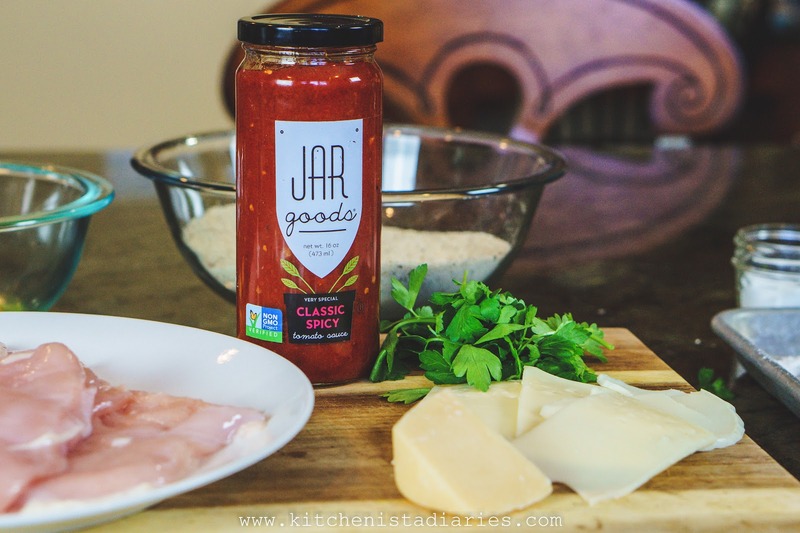 It's easy enough to make your own marinara sauce, but if you keep a great one like Jar Goods' Classic Spicy on hand you won't feel guilty at all for this shortcut. 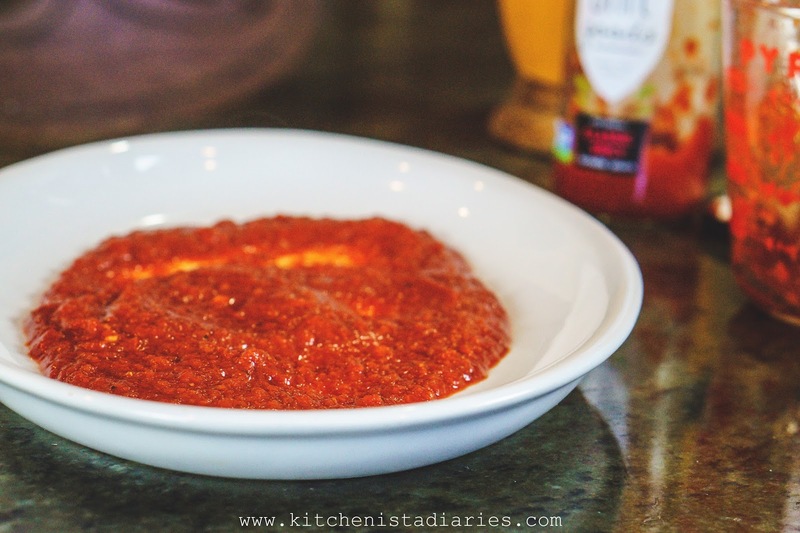 Tomato sauces are something I pretty much always have in my pantry, but I typically doctor them up a little bit when I cook. I can honestly say I didn't need to add so much as a pinch of salt here. This sauce tasted fresh, homemade even, and I loved the subtle spicy kick. But what I really appreciate is the simplicity in the ingredients (tomatoes, water, olive oil and onions followed by a few spices and red pepper.) Noticeably, there's no sugar! Classic Spicy tomato sauce is a staple that's definitely getting added to my Whole 30 survival pantry when I'm back on the program in the new year. This will flow seamlessly if you get all your ingredients prepped and organize your work area. In one bowl, season the flour with salt and pepper. In another bowl, beat the eggs with a couple tablespoons of water. And in the third bowl, you'll add your bread crumbs. 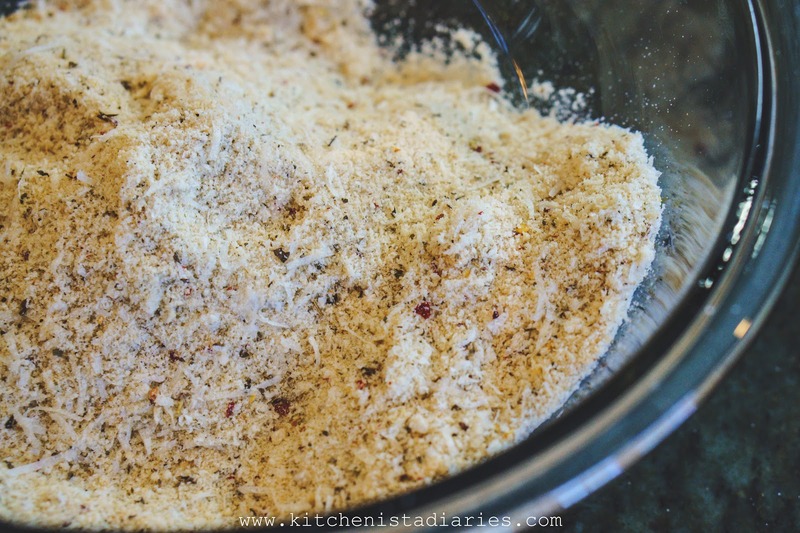 I run the bread crumbs through my food processor with the chile flakes and garlic powder until they're finely ground. Then, I grate a ton of parmesan into the bread crumbs. 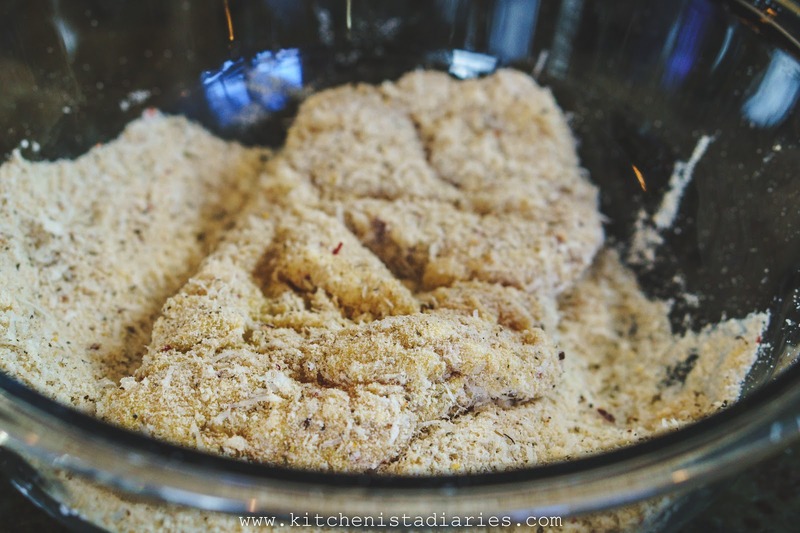 The fine texture of the crumbs helps the crust stick to the chicken better. Now that's something I didn't know 10 years ago! 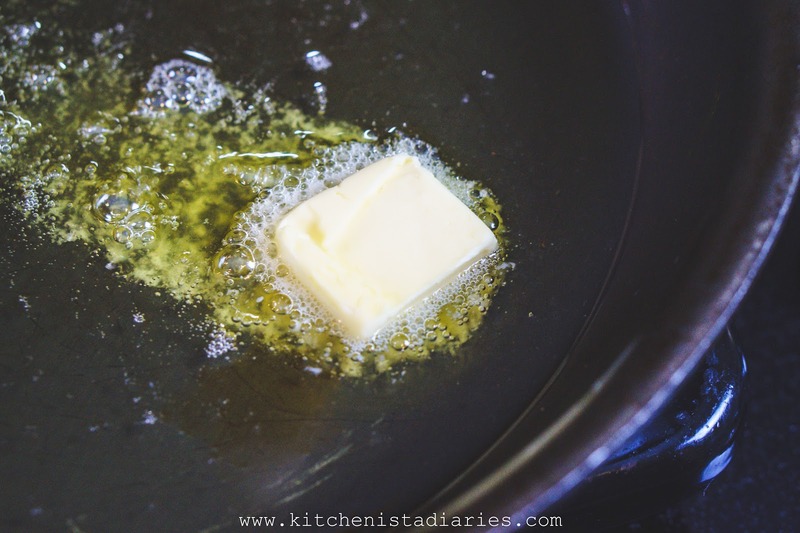 Start out by heating your skillet over medium high heat and adding enough olive oil to coat the bottom of the pan. You don't need to use the fancy stuff here, just regular olive oil or one labeled as light. 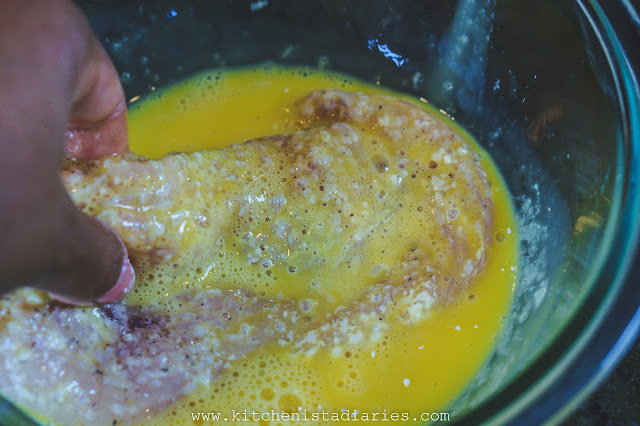 Add the butter as well, which will add flavor and color to the crust of the chicken. Pound out your chicken between plastic wrap or inside a ziploc bag. You want really thin cutlets. I use a meat mallet, but a rolling pin works in a pinch. If they're huge chicken breasts you can cut them in half. Season the chicken generously with salt and pepper. 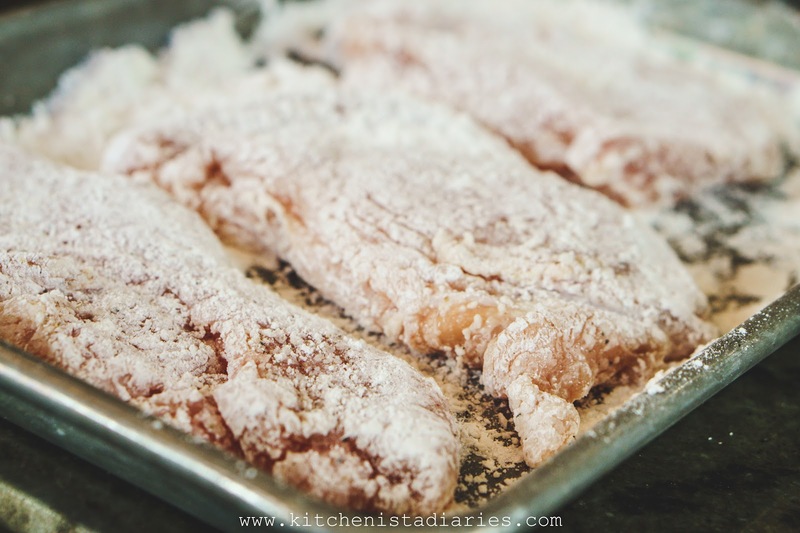 Dredge each chicken cutlet through the seasoned flour so that it's coated. 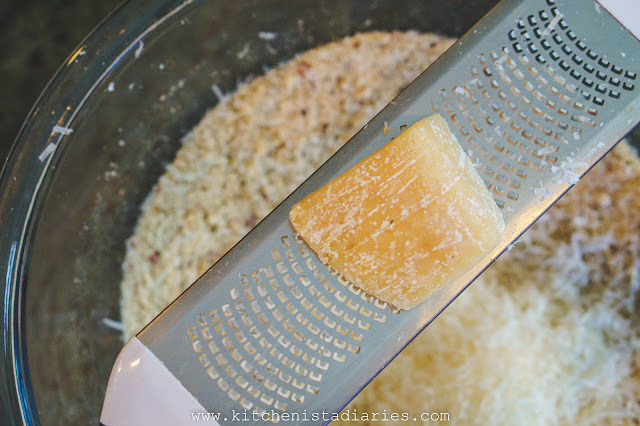 This will help the egg and bread crumb coating to stick. Then press it into the bread crumbs so it's nicely coated. Flip and get the opposite side coated too. 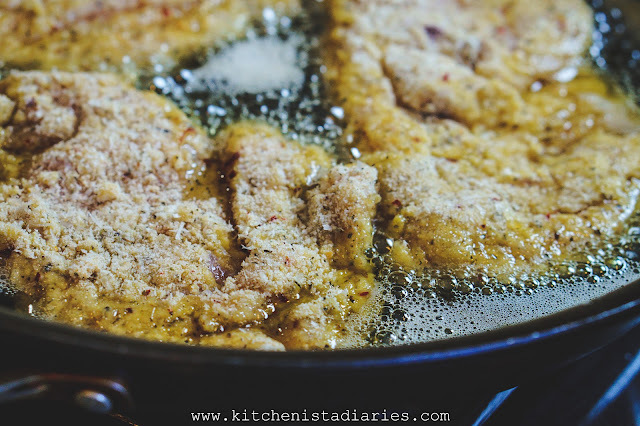 And that cutlet goes straight into the hot sizzling oil. 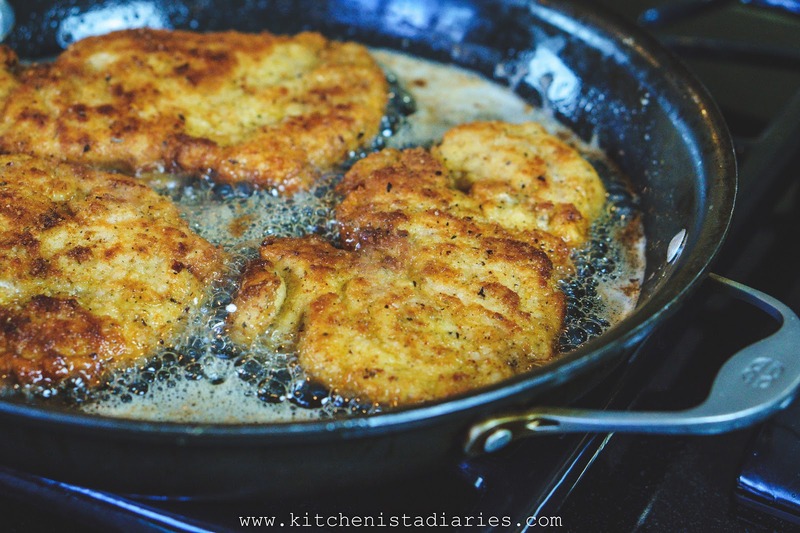 Repeat until all your cutlets (or as many that will fit at once) are in the skillet. Like I said, as long as you set up and organized little production line, it all flows pretty easily. 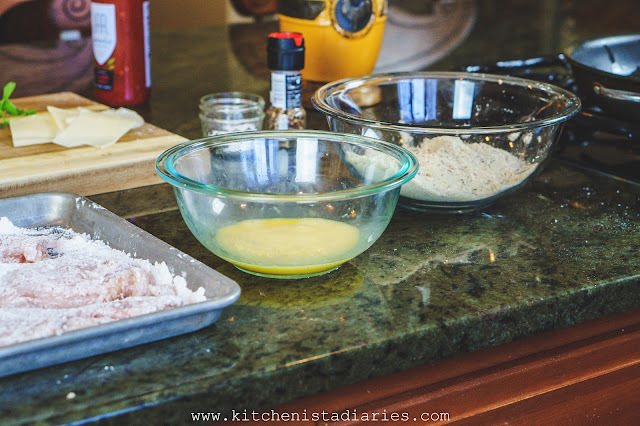 The chicken should go from the flour, to the egg, to the bread crumbs, and right into the pan. The only thing to keep an eye on here is the temperature of the oil. You want the chicken to be sizzling but not browning too quickly, or it won't cook through. If it's not sizzling at all, that means the oil isn't hot enough and you'll end up with creasy cutlets. Pan frying is a bit of an instinctual balance act but you'll get the hang of it with practice. Once the bottoms of the cutlets are golden and crispy, carefully flip them over to cook the other side. These should cook for about 6 minutes or so total. They'll finish in the oven, so once the color looks like this go ahead and take them out so the chicken doesn't overcook. 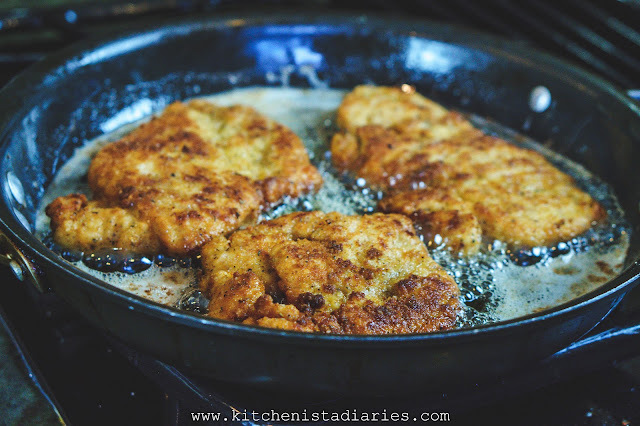 Transfer the fried chicken cutlets to a baking pan. 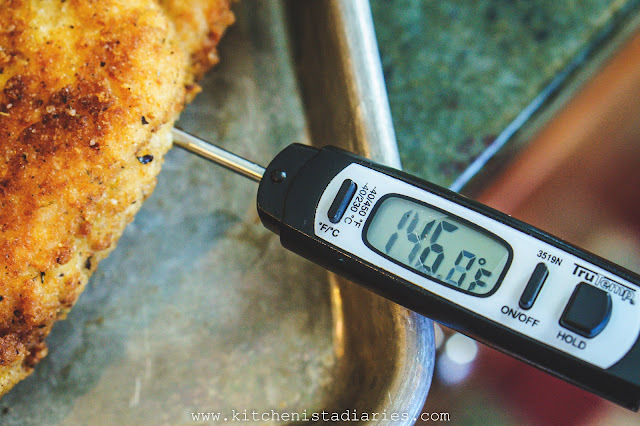 Use your thermometer to check the temp of the meat, which will give you an idea of how much longer it needs to cook. I was at 146° F, which was perfect and gives me some wiggle room for the chicken to be in the oven in the next step. Chicken needs to be cooked to 165° F, but I typically will aim for about 155° F for the breast because residual heat will continue to bring the temp up after it's removed from the heat source. Ladle about half of the sauce over the chicken breasts.For presentation I like to keep some of the breading showing, but that's up to you. 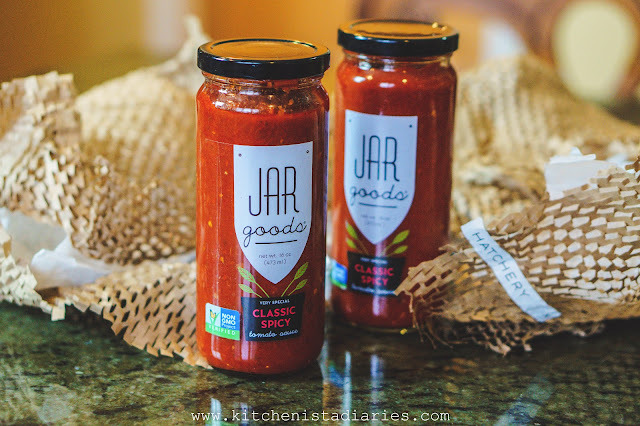 I really love that I could take Jar Goods' Classic Spicy sauce straight from the jar into my recipe. Trust me, I'm picky and that does not happen often! 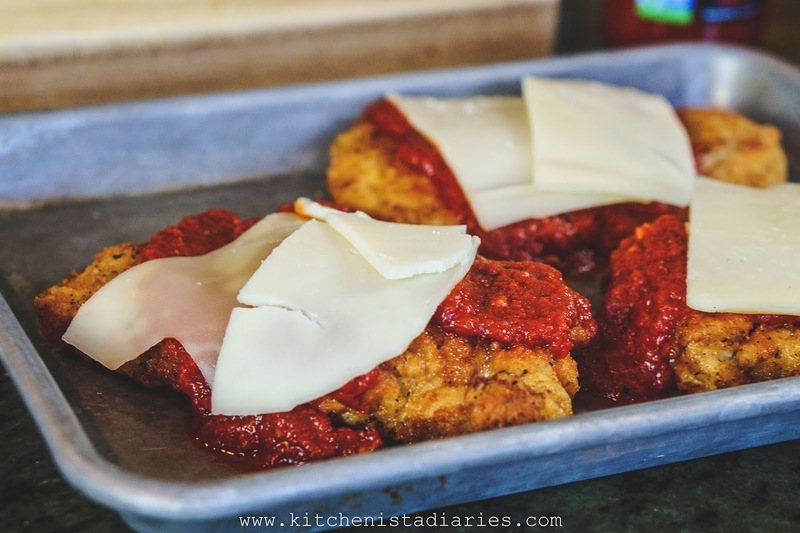 Now arrange the cheese slices (or shredded, either will work) over the sauced chicken cutlets. I used a mix of fontina and provolone here. You want a good, melty Italian cheese. 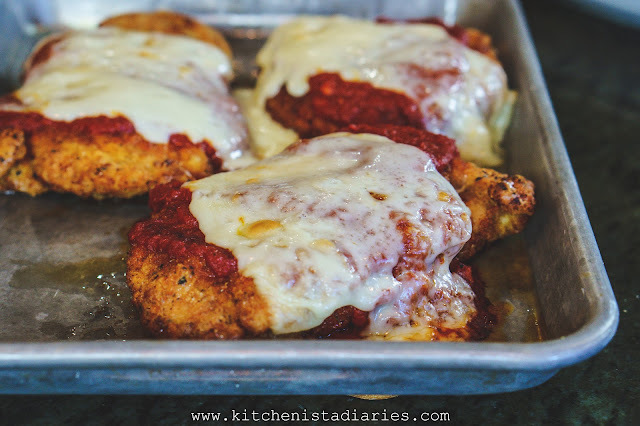 Now pop the chicken under the broiler for a couple minutes until the sauce is warmed through and the cheese is melted and bubbly. 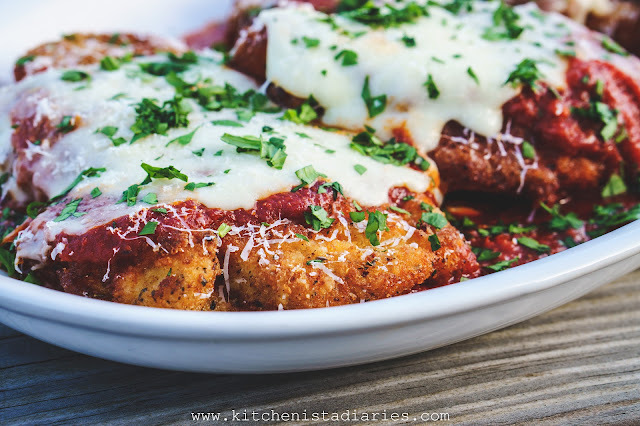 To serve, spread the remaining sauce on your plates or serving platter. Transfer the chicken to the serving platter, garnishing with parsley. Ok, I went a little heavy on the parsley but you get the idea! You could also use basil if that's your thing, make it your own. 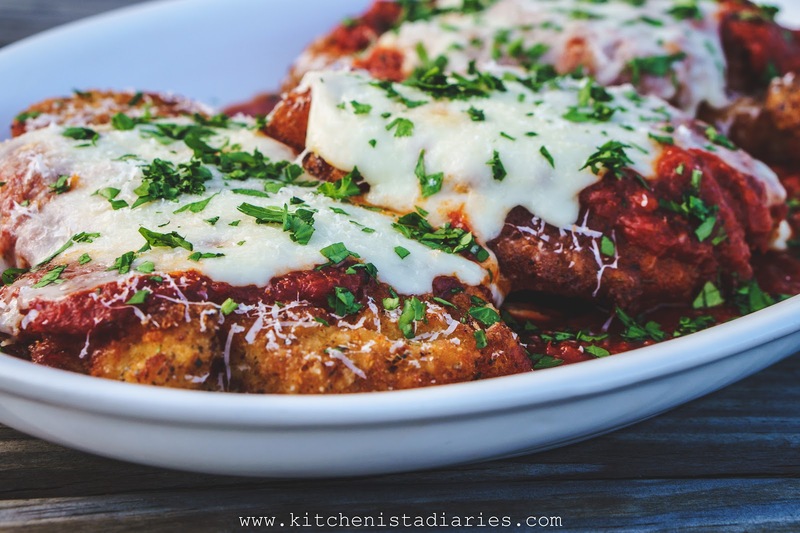 And because this is chicken parm...you'll want to grate more parmesan cheese on top! Enjoy! 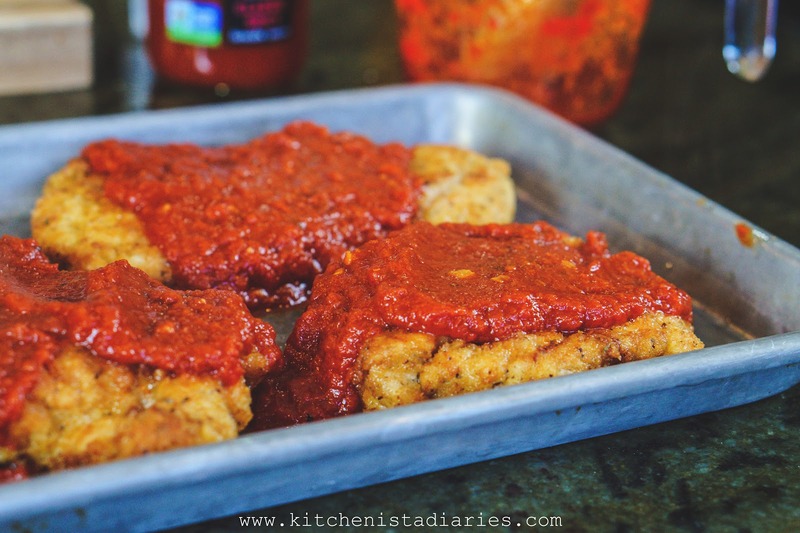 Thanks to both Hatchery and Jar Goods for a great sauce, it really made this dish! 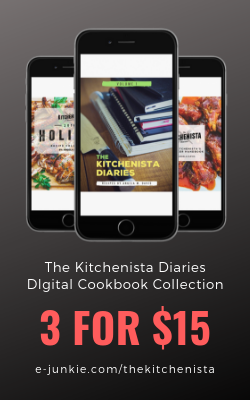 If you're interested in trying out Hatchery's subscription tasting box, enter code KITCHENISTA at checkout and get your first box for just $10! Edit: little Italy in NYC.